In partnership with Artists Association of Nantucket, the NHA presents a new exhibition of selected paintings of the Nantucket Art Colony of the 1920s and 1930s. The exhibition illustrates the history of Nantucket’s appeal to painters and art teachers who came to Nantucket and formed the Nantucket Art Colony, working from artists’ studios and gallery spaces created from the relics of Nantucket’s whaling past – clusters of shacks, boathouses, and old buildings along Nantucket’s waterfront. The Nantucket Art Colony exhibition is curated by Robert Frazier, AAN Curator of Exhibitions, and features artwork from both organizations’ collections. Mediums of watercolors, pastels, drypoint etchings, and oils, on a variety of subjects from harbor scenes, pastoral landscapes, still lifes and portraits tell the story of the island’s transformation into a haven for artists. 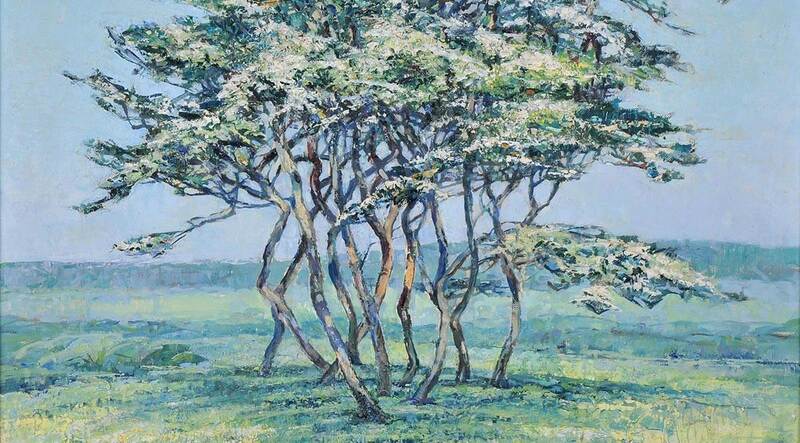 The work of treasured Nantucket artists such as Anne Ramsdell Congdon, Frank Swift Chase, Isabelle Tuttle, and Edgar Whitfield Jenney, among others, will be on view at Greater Light, once an artist studio and summer residence of the Monaghan family, and currently part of the NHA’s collection of historic properties. This exhibition is supported by a generous grant from the Margaret Ritchie R. Battle Family Charitable Fund.